In 1802, Maxime Martin, a Marseille soap manufacturer, purchased the estate of Astros in Vidauban in Provence. His grandson then built the splendid italian styled villa. As the latter had no descendants, the property passed over to the family branch of the Maurels, who still manage the estate today. In the 1950s, Astros devoted itself entirely to winegrowing, and it was getting famous as a producer of high-quality rosé wines (75% of the total production). The Vin de Pays are called Domaine d'Astros, the AOC wines are labeled with Château d'Astros. Numerous awards attest today to the first-class quality of the Astros wines. 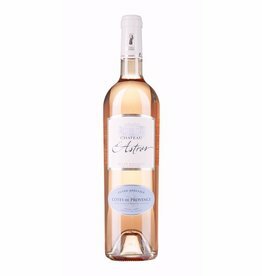 Seductive rosé wines with soft character, which taste like sun and holiday.